The Graf Zeppelin, built in 1928, was huge -- 804 feet (245 meters) long. That's more than twice as long as a football field and four times longer than the Goodyear blimps that fly over many American sporting events today. Along with its sister ship, the Hindenburg, the two hydrogen-filled blimps flew between Europe, North America and South America on hundreds of flights. ﻿Two lengthy flights to the Middle East were conducted by the Graf Zeppelin in 1929 and 1931. 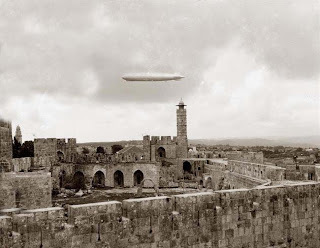 The ship's flight over Jerusalem in 1929 took place at night, and no pictures of the ship were taken. But the flight in 1931, in daylight, was photographed by the American Colony photographers and by an Armenian photographer in Jerusalem, Elia Kahvedjian. 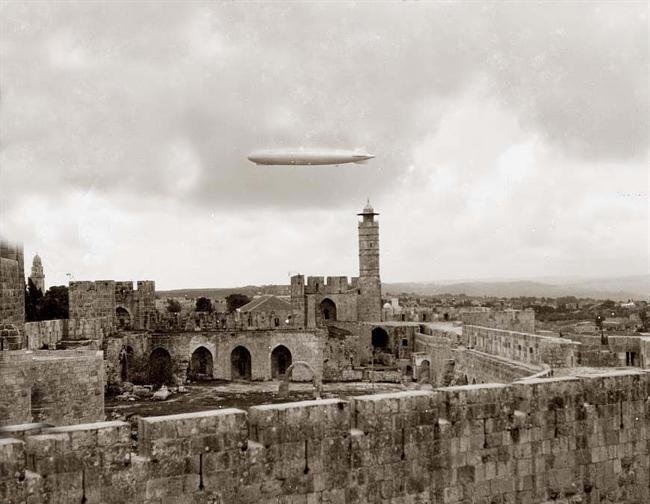 Mail sacks were supposed to have been dropped from the Graf Zeppelin over Jerusalem, Haifa and Jaffa. The airships did not moor in Palestine but flew from Germany to Cairo, then over Palestine and then back to Germany. The flight took 97 hours and traversed some 9,000 kilometers over 14 countries. With the spectacular crash of the Hindenburg in New Jersey May 1937, all flights of the two behemoth balloons stopped.